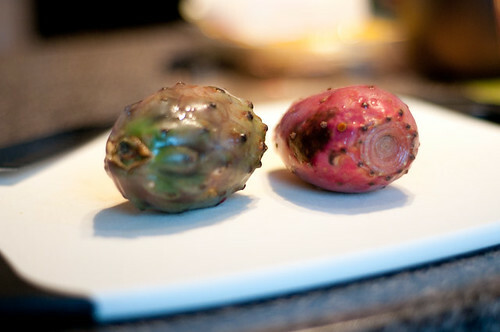 Just in case you've never played with these two fruits. This is what you do. 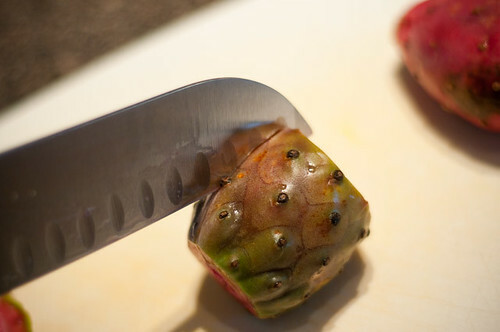 I bought two prickly pears this week. They were on sale. 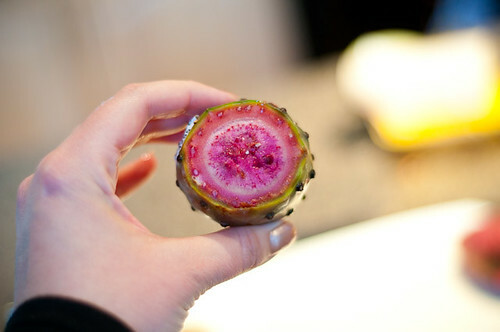 I'd never had prickly pear before, so I gave it a try. Should you too be so curious, here's what to do. 1. Behold pear in all its prickly goodness. Be careful when handling. I was not careful. I got to spend a little time picking out the picky little 'pricks' of the pear from my fingers. 2. Cut the ends off. Oooo...pretty. 3. Make a slit the length of the pear. 5. Chop as needed. The pear is full of small edible seeds. It's got an interesting flavour...dunno if I'll go for it again, but surely all that fun fuschia colour means it's full of vitamins and antioxidants, right? 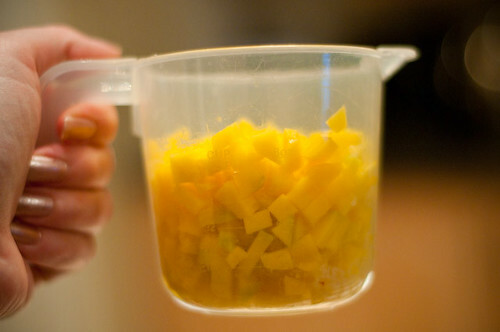 I'm not sure if this is the be-all and end-all of mango cutting methods, but it works for me. 1. 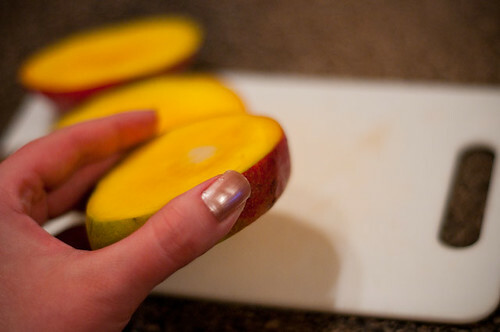 Stand your mango on end, and cut down one side, along the seed. 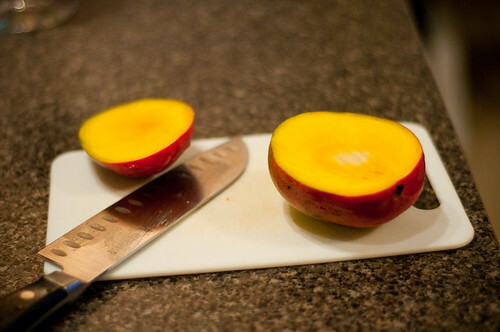 The photo does a good job of showing the kind of cut you'll make....when you're cutting, you should kinda 'feel' the pit of the mango along one side of your knife. If your knife gets stuck at any point, you're too close to the pit. 2. Do the same on the other side of the mango. 3. 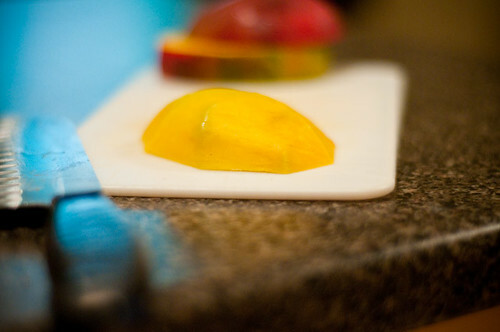 Take one of the mango slices and place it, cut-side down, on your cutting board. 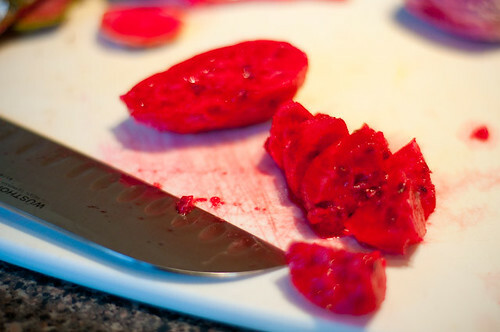 Cut off the skin of the mango. *there are other ways to do this. 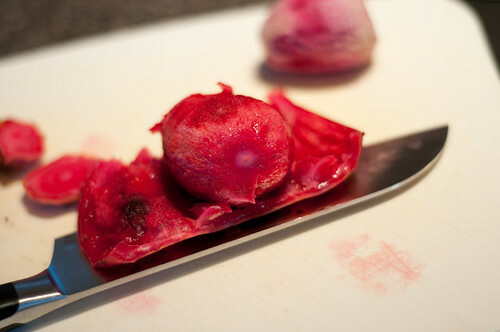 I just try to minimize the simultaneity of holding both a slippery fruit and a super sharp knife. Repeat this on the other side. 4. Chop as needed. You should also run your knife along the pit. You should be able to get a long piece from each side of the pit. Cut the skin off of it as well. So there you have it. Your fruit education of the day.